If you're looking for a fun, approachable mosaic project, nothing beats a tray. Because you don't have to cover the entire surface of a piece of furniture or backsplash, you can take your time, get creative, and perfect your mosaic art skills. You'll end up with a lovely decorative item that you can use to enhance your decor or give as a special, one-of-a-kind gift. There are no rules when it comes to mosaics. You can incorporate stained glass, tiles, found objects, and old china. 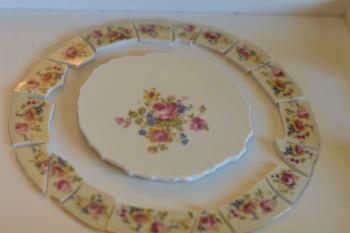 This pretty design used thrift shop china plates to create a feminine and frilly tray that's perfect for serving tea or setting out treats for guests. It also looks lovely just sitting on your coffee table. Mosaic work like this is time-consuming, but the process is relaxing and fun. Expect to spend about four hours doing hands-on work, but make sure you account for a few days of drying time as well. The cost of this project will vary depending on the materials you use. In many cases you can find materials at thrift stores and spend under $25 to make your tray. Pick up a sturdy wooden tray to serve as the base of your mosaic. You can find options at thrift stores and home decor shops. No matter where you buy it, make sure the bottom of the tray is firmly attached and very stable. If it flexes or seems to react to pressure from your hand, pick a different one. This tray will need to support the weight of the mosaic as well as anything you intend to place on the completed tray. Start by spray-painting the tray. Make sure it is clean first, and if necessary, run a little sandpaper over the surface to rough it up. Then use light coats to avoid drips. Make sure you work in a well-ventilated area. Allow the tray to dry for 24 hours. While the tray is drying, you can cut the china. Put on a pair of safety goggles. Place one china plate inside a shallow cardboard box. 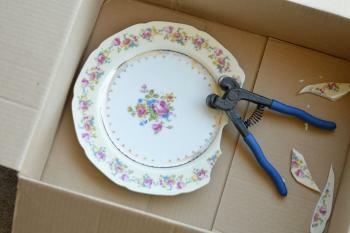 Use the wheel nippers to snip off the outside edges of the plate. To do this, angle the nippers away from the center design and continue nipping until you have removed everything but the center. This will be the focal point of your tray. Use the other plate to cut pieces of the edge design. To do this, angle the nippers straight across the plate and cut it in two. From there, cut wedges. Then cut off the center portion of each wedge so you only have the edge. Still wearing your safety goggles, use a Dremel tool with a diamond bit to grind off the sharp edges of the china. You only need to worry about the edges on the top surface of each piece, since the bottom will be glued to the tray. Grind down every piece you think you might use, even if they aren't ones you originally planned for when cutting. You never know what you might want when you make your design. Be very careful not to cut yourself as you work. When the tray is dry, place it on a protected work surface. Put a medium-sized plate face-down on the tray and center it carefully. Use a pencil to trace a line around the plate. You'll use this as a guide for your design. Place the large central portion of the first plate in the middle of the circle you drew. 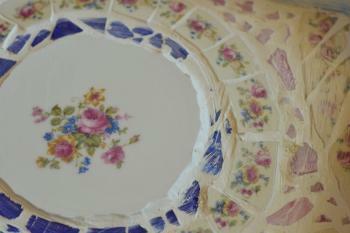 Arrange the edge pieces from the second plate around it, lining the edges up with the circle. Create corner designs with the remaining china pieces. When you're happy with the design, use E6000 to glue down the pieces of china. Work in a well-ventilated area. Allow the glue to dry slightly before proceeding. When the glue is dry enough that the pieces won't slide around easily, begin filling in the design with the glass mosaic bits your purchased. You can use a contrasting color between the central focal point and the edge pieces to highlight the design on the china. Then fill in most of the tray with a light color, such as pink or white. Allow the glue to dry completely, which will take at least 24 hours. Mix up the grout according to the package directions. While you're waiting for it to reach the appropriate consistency, apply painter's tape to the inside vertical sides of the tray. This will protect the wood from the grout and will keep everything neat. Put on some rubber gloves and apply the grout to the mosaic. Use the grout float to push it down between the pieces of china and glass. Wipe off the excess with a damp sponge. Allow it to dry for a few minutes and then begin wiping each piece of the mosaic with paper towel. Go over each piece at least twice to remove any excess grout and avoid grout haze. Allow the tray to cure for at least 48 hours. Then apply a sealant to protect the grout from spills. Cut stained glass into a beautiful design and use black grout instead of white. This will give you a totally different look. Include found objects in your tray. Some fun ideas include keys, buttons, and old jewelry parts. Try creating a design with the glass pieces, such as a spiral, a flower, or an ocean wave. Highlight an old letter or copy of an old photograph as a centerpiece for your tray. Use decoupage medium to adhere the paper to the underside of a piece of clear glass. 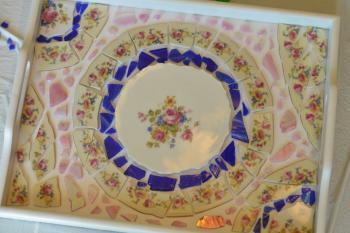 Then glue the glass to the center of the tray and add your mosaic around it. Keep it simple and purchase mesh sheets of mosaic tiles from your home improvement store or tile shop. Simply apply these to the tray using glue or Thinset mortar and then grout. 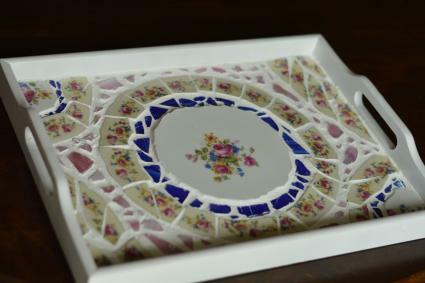 If you're new to the art of mosaics, a tray is a perfect first project. Have fun experimenting with different designs and giving your tray a unique look. You'll love the results and enjoy the process too!